Do you think that a trip to the Norwegian Fjords sounds like something rather dull? Even more so if you are on a cruise ship? These are the Ultimate Tips For Cruising Fjords For Travelers! It is time to throw any and all doubts aside and “Just Do It”! My advice is that you have to find 7 days you can take off from work, find a cruise and get yourself to the Fjords in Norway! It is just the most glorious, breathtaking and calming experience you can imagine. I had never been that interested in going there, thinking it sounded like something old people did. But having been I can honestly say that the Fjords of Norway has been added to my list of my most favourite places. I will go back. In this article I will give you my 8 ultimate tips for cruising the Norwegian Fjords, based on cruising there on Cunard’s Queen Elizabeth beautiful ship. While it is not a country that is top of mind for people. If you say Norway to most people, they will think first of the incredible Fjords, Mountains and lush green scenery. To many commercial people it is known for its huge North Sea Oil and Gas finds and business. In recent years, Norway was in the headlines when, in 2011 Anders Breivik murdered 77 young people and injured 96 in a bomb attack in Oslo and on a small island hosting a Youth Conference. Norway is the north of Europe on the West Coast of the massive Scandinavian Peninsula. Most of its western border is along the North Sea, and most of the east is bordered with Sweden, with Finland at the top. The Fjords were created by massive Glaciers of ice that carved them out of the hard rock, gouging deep channels which are now filled with water. They go as far as 120 miles inland from the sea, and can be 1300 metres deep. They are wide enough for huge cruise ships to sail right into them for many miles. Today there still are glaciers inland, which are popular things to visit both by cruise passengers and land based tourists. Norway’s economy, livelihood and culture is most strongly linked to the sea. Right back to the Vikings that sailed out to explore, plunder and gather spoils across Europe, through to the huge Sardine and fish canning industry, and more recently from Oil and Gas found off shore in the North Sea. Perhaps due to so much linkage to the sea, one thing that struck me travelling around is that there is not a lot of visible “heritage” on land. If you visit many European Countries, you see stately homes, castles, and fortresses all over. This seems less visible and apparent in Norway. It is about the scenery, the sea and the outdoors. Although it is cold and very snowy in Winter, and the Summer Season is quite short, the people of Norway are very outdoor focused and sporty. Waking, hiking and outdoor pursuits are very popular and a big focus for holidays. Norway is very environmentally minded, and aggressively protect the environment. For example, they are the only country in Europe that currently levies a tax on cruise ships in their waters. They tax based on how much fumes are emitted. As a result cruise ships ensure they use high grade fuel and try and reduce emission even more than usual. Norway today has a constitutional monarchy. This was put in place in 1905. Previous to this, they had long periods when they were in a union with Denmark and, before taking independence and putting in place the monarchy, they were in a long union with Sweden. Politically, Norway is liberal and fiercely protects their independence. in both World Wars they tried to remain neutral. Although in WWI most of their large merchant fleet was used by the British. In WWII although they had declared themselves neutral, the Germans invaded in 1940 and occupied the country – despite fierce resistance. Although they were one of the big proponents f the European Free Trade Area, they are not a member of the European Union (despite holding referendums, the people have rejected joining the EU). As I mentioned in the opening, Norway and the Fjords have to be added to everyone’s “must see” list. It is not a surprise to me that many of the areas have been declared World Heritage Sites. The Fjords are more intriguing and impressive than photos can capture. Nature certainly excelled itself when creating them. The advantage of cruising there is that you get to see many different areas in one trip of a few days. It is quite a trek to travel by land to see so many. Although they are not all that far as the crow flies, sometimes 100 miles, but the huge mountains and routes you need to follow make it easier to cruise. In many places you will see very frequent Fjord Ferries taking hikers, cars and buses to and from the various Fjord villages. Some of the places you will visit have only 250 or 300 permanent residents, and do not have huge hotel capacity. So cruising there makes it easy to get a room – with a view that changes of them too! If you are nervous about taking a cruise and worried about seasickness and motion, a cruise to the Fjords is a good taster. Usually in Summer the cruise through the North Sea is calm and still, and the Fjords are like glass and you forget you even on the water. Summer! The season to visit is actually quite short and really is focused around the June to August months. The cruise industry pretty much only goes there in these months, though going to the Fjords when the mountains are all covered in snow would be an amazing sight. In summer you have very long days. Depending how far north you go, you can also get “Midnight Sun”. As Norway is so far north, the days in summer are very long. We got as far north that meant that sunset was at 11pm, and sunrise about 4:30am. This means you get fabulous views right late into the night as you cruise in and out of the Fjords. (3) Chose the Right Cruise Line! It did seem to me that on average the profile of people on cruises to the Fjords is older than some cruises. So it is important that you chose the right line that best suits your interests and needs. In my 16 Top Tips for First Time Cruisers article, I talk about how to do that, and which line is best for which type. For older look at lines like Saga. So many lines go there you can find the right one, but make sure you research and discuss with your agent. You should also consider looking at lines with smaller ships, rather than the large Cunard, P&O and Royal Caribbean sized ships. This means there are more places and options that they can go and explore. So lines like Seabourn, some of the smaller Costa Ships and even the P&O smaller ship Oceana. (4) Chose the right route! Make sure that your route includes all or mostly the small villages in the Fjords and not too many of the larger towns like Bergen and Stavanger. They are fine and important, but they are not magical and special like the Fjords. If you cruise from Southampton, or one of the European Ports, you will have a day at sea getting there and getting back, and visit 4 places. It would be a pity if 2 of them are cities. This is another tiny village. Just 480 residents (an increase apparently of 29 since 1999!). It is also a popular stop, but is so small that only 1 ship can be in dock at any one time. So ships usually have to tender passengers in. Olden is in the Nordfjord, a very long way down it (close to 100 miles). It is known as the best way to access the Jostedal Glacier. You can visit the Briksdal, which is an arm of the glacier, and do a tour on it by walking, a small trolley car (6 people + driver) or get up and close in a RIB boat. As this is another way to access the Jostedal Glacier it is unusual to have both Skjolden and Olden on the same route. Pity! 2nd largest city in Norway, and it was the Capital before Oslo took that title. It gets about 250 ships visiting a year. A population of 250000, surrounded by 7 mountains and you can travel on a cable car up the largest (Mount Ulrike) or Venicular (Mount Floyen) to get great views of the city. Not as good as looking at the Fjords. A stroll through the Old Town called Bryggen is worthwhile with the fish market. 4th Largest city and closest to the oil fields. If you do go here, the main thing really worth doing is taking one of the 3 hour boat trips that leave from where the ships dock to the Lysefjorden and see the massive Pilgrim Rock. There is an old town area where the ships dock, but this city is a more functional and practical city of commerce than tourist. We did the hop-on hop-off bus but there was not a lot of places to excite in my view. Sorry to fans of the city! Make sure you have as many of the Fjord towns as you can! I don’t usually include this tip. But for this cruise it is a must. The scenery is spectacular and a good camera is a must. I took about 500 photos on the 7 days. Most on the core 4 days in ports. You can see all of them in my Flickr Cunard Fjords Cruise Set. The cruise lines have many options for tours, and will encourage you to book them in advance. My advice is to not do that, unless there really is something on their options that you want to do, or you are not that mobile and able to walk a lot. In all of the ports, you either dock right in the town or for smaller places you go right into the village on the ship tenders. The places are small usually, like Geiranger with only 300 residents and Skjolden with only 250 residents, and so anything that is on offer will be right there when you get off. All of the places are geared for ships arriving and there will either be a tourist office or the people that offer tours ready for when you come off the ship. They will be cheaper and know they need to get you back in time for departure if they are longer trips. Most places also have the Hop On – Hop Off bus tour which is a cost effective way to see all the main sights. For example, in Geiranger they take you to all of the main vantage points to get views. The problem with most of the cruise tours is that they are largely just drive around trips sitting in a bus. It is much better to walk or use the hop on – hop off bus. There is to a lot to see other than the views, so do it yourself. (2) Get on the water and see it from there. Everywhere has this option too, from kayaking, RIB speedboats to leisurely boat cruises in Geiranger to a 2 hour round trip boat ride down the Lysefjord to see the massive Pulpit Rock in Stavanger. Then with ay spare time stroll round the old town area of the big tones (which is where you will be docked) or the village you are in. Shops are closed on Sundays, and in some of the smaller villages on Saturday. Though if ships are in many will open to not miss the trade. Expensive. Things are very expensive in Norway. It has very high salaries and wages, but prices to match. Stavanger is in the top 10 places to love in the world. So it is not really a shopping destination as you will find things cheaper elsewhere. Souvineers and tourist gift items are mostly around distinctive Norway Snowflake style design knitwear, hats and slippers. There are loads of Trolls, which are part of the traditional storytelling and culture. Then the usual stuff like Snow Globes. Overall, I was disappointed to not see a lot of local crafts and the items felt more mss produced and all the same everywhere. So not a lot to splash your cash on. Norway is not in the EU and so also does not use the Euro. the currency is the Norweigian Krona (about 10 to 1UK£/ 6 to US$). You can pay by card for tours and gifts and so maybe you do not need any or very limited. Either way do not take a lot as not a lot to spend it on that you cannot use cards for. Access is poor on the ship, and always expensive ($48 for 2 hours). It is very intermittent and unreliable due to the huge mountains. The secret is to wait until in a port as there is free access to be found, or very cheap access like £1 in the Community Centre in Skjolden. My tip is to ask, follow or look for the clips of your ship’s crew on land. They will know or have found the free access. There were many places but amusing to see crew with their laptops and passengers with their smartphones congregating around the outside of centres, Burger King in Stavanger and so on. But follow them, they will save you tIme and a lot of money! Do you have any more tips to add? Please add them to the post or email me and I will add them. Watch my video tour which takes you on a typical 7 night Fjords cruise in just 10 minutes of highlights. This I filmed on my Cunard Queen Elizabeth Cruise in July. On my YouTube Channel are more detailed videos on each destination I visited. July 20, 2012 in Cruise Ship, Cunard, Norwerian Fjords, Queen Elizabeth, transportation. ← Highclere Castle (known as “Downton Abbey” on TV). Worth taking time out to visit, or just see it on TV? So glad you wouldn’t waste money on onboard Internet. I think you get it free in the higher classes on some ships, but it’s not worth a special fee. Personally, cruising is about escaping the phone and the Internet. Thanks for taking the time to read and comment! On Cunard you get free Internet hours based on your level in their loyalty program not your stateroom grade, and is plenty enough to do the odd bit if email check-in every second day or so. But agree that switching off is best. The speed is really slow and so it is too frustrating to do much – which also helps one to stay switched off!!!! Thanks, Gary, for the very detailed articles, photos and video about the 7-day cruise to Norway. It must have taken you a lot of time and effort to put this together; it is appreciated. We are taking an almost identical cruise in June on the Queen Elizabeth. We are fortunate that Flaam is included. We are especially looking forward to riding the famous Flaam-Myrdal railway. Although we have crossed the Atlantic many times on the QE2 and QM2, this will be our first voyage on the QE and, in fact, our first actual cruise on Cunard. 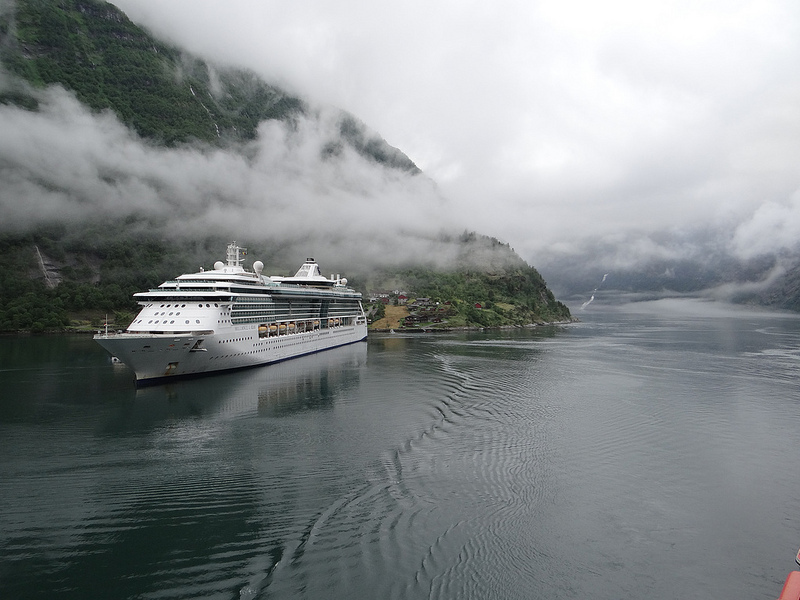 About our seven-day cruise to Norway on Queen Elizabeth, the best thing I can say is “Wow.” I am a fan of ships, not cruises, but this was one super cruise. About the ship, in which we were travelling in Princess Grill, I can say the layout of the Grills facilities was better than on the Queen Mary 2. The only downside is the stateroom. Although they are the same sq. footage as on the QM2, they are long and narrow and have a tiny balcony. Overall the interior décor of the QE was more pleasing to my taste than the QM2. (Transatlantic crossings are still my favourite, so we will be on the QM2 again next year). Flam was gorgeous and the rail trip to and from Myrdal was as spectacular as everyone says. In Geiranger we took a one-hour tour on a replica of a Viking boat. We were issued with smocks, horned helmets and plastic swords and had a great time. This boat carries only 10 people, so it is not offered by Cunard as an excursion. It can be booked through the town’s Tourist Office next to the tender pier. Thanks for the update and thoughts on your trip. I think the QE is the best decor of the 3 ships, and I guess they have been learning with each of the new ships. The Transatlantics are special, and am sure you will love it again. We are on the QM2 for 5 weeks next year from Sydney to Dubai. Can’t wait…..!